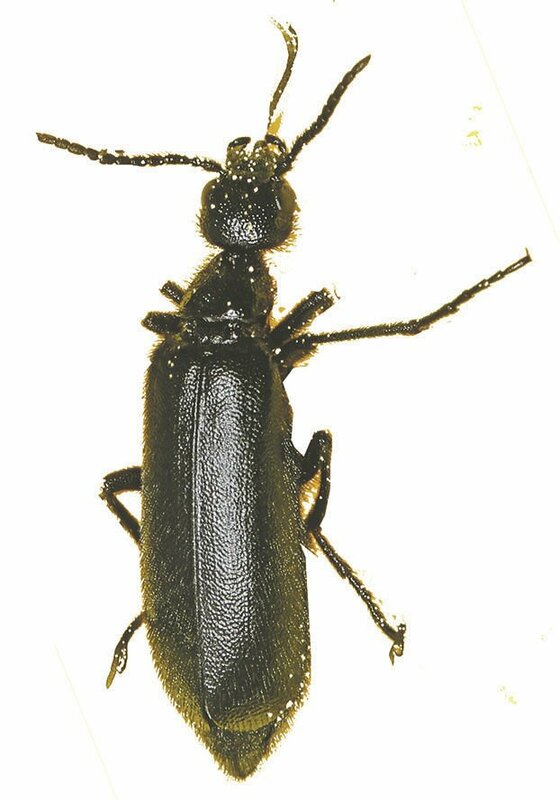 Alias: Blister beetle or black blister beetle. This genus is usually identified by its long, black body and very pronounced “shoulders” that protrude from the abdomen. Adults seek out rangeland that is breeding grounds for other foragers such as grasshoppers. The eggs hatch in the spring and the larvae are a simple little grub that seeks out grasshopper eggs. After pupating, the adults have a chewing mouthpart that is more adapted to feed on plants. Crimes: Blister beetles are not a huge feeder and will not reduce yield in a hay field. Instead, these little buggers produce cantharidin, which is an extremely toxic compound. Contact on skin will cause painful blisters to form. If consumed (usually by livestock in their hay), animals can be poisoned and even die. Just a few beetles in a windrow is enough to kill a horse. Redeeming Qualities: The larvae are predators against other pests such as grasshoppers and can keep their populations at bay. Sentence: Luckily, they are not common in eastern Idaho, although they do exist. Monitor fields regularly, especially after large grasshopper outbreaks. Monitor livestock for any irritations around the tongue and mouth. Do not handle the insects without gloves. Adults do not usually emerge until after the first cutting of alfalfa, so that crop is usually the safest. If any beetles do exist in a hay field, carbaryl or a pyrethroid-based insecticide will control adults. They should fall to the ground and not be picked up by equipment but avoid unnecessary raking anyway. Always follow pesticide label instructions and contact your veterinarian or doctor if you suspect any consumption of blister beetles. For more information on dangerous and beneficial bugs, call UI Extension educator Joseph Sagers at 208-745-6685 or email jsagers@uidaho.edu.